Yelp's Word Map service visualizes the Internet review and rating service's social data into a handy map that now tells you things like where the hipster population is densest in New York City. Feel like going out to eat, but want to avoid overpriced craft beer and ironic Civil War-era facial hair at any cost? Back in the day, all you could rely on to escape swarms of insufferable hipsters was word-of-mouth or the basic intuition required to glean some sociological data from extensive Yelp reviews of yet another dive bar refashioned from an old auto shop in Brooklyn. 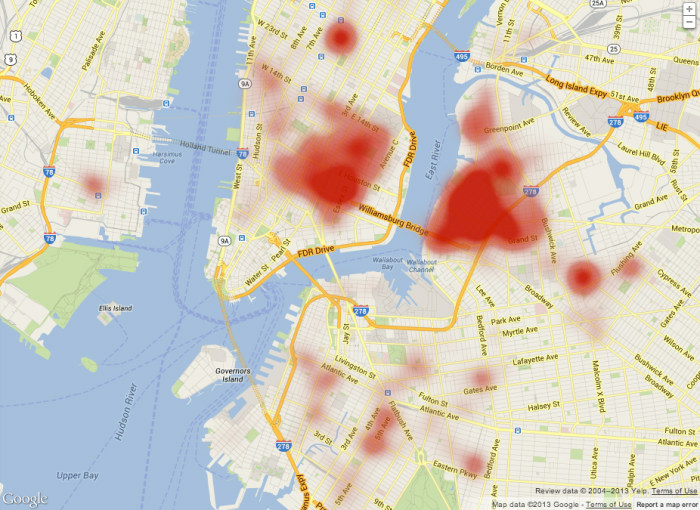 Now, thanks to Yelp's new data visualizing "Word Map" platform, the popular Internet review and rating service can map entire regions of a city like New York based on the density of particular keywords. Surprisingly, there's less of an overlap between "hipster" and the two main keywords you'd assume would be on the top of their food pyramid — "bacon" and "pbr." While hipster spots are densest in the impossibly cool cultural mecca that is Williamsburg, Brooklyn, it only overlaps with the pork product and independent beer label in, once again, the Lower East Side. No wonder everyone wants to live there! Have some fun with the Yelp Word Map here. Yannick LeJacq is a contributing writer for NBC News who has also covered technology and games for Kill Screen, The Wall Street Journal and The Atlantic. You can follow him on Twitter at @YannickLeJacq and reach him by email at: ylejacq@gmail.com.